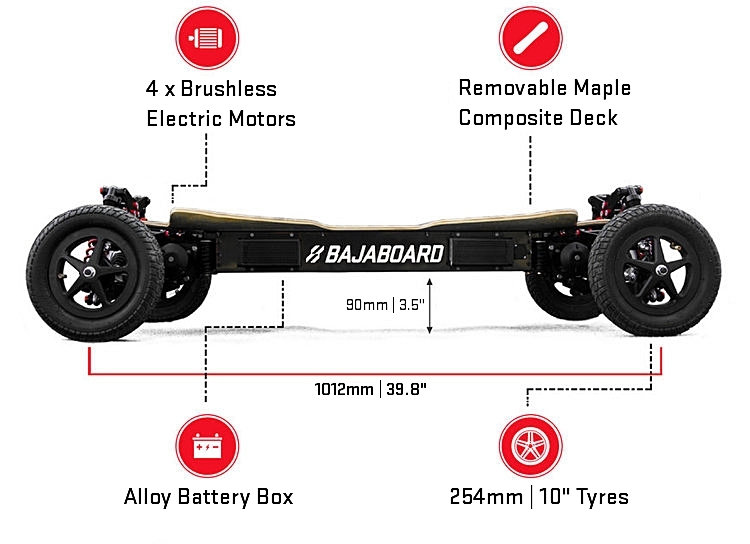 The BajaBoard G4X is the POWERHOUSE of the BajaBoard family. With 4 motors (one driving each wheel), the G4X will accelerate you from 0 to 50kph in just 3 seconds. For general cruising, the front motors can be switched off to conserve battery. And they can be switched on remotely the moment you hit a rough patch. G4X has in-built TRACTION CONTROL and ELECTRONIC DIFFERENTIAL which you can disable. It's also no slouch when it comes to range - with a 180-190lbs rider, the G4X is capable of reaching up to and OVER 30KM on a single charge. If you want the ultimate joy-riding e-board, then the BajaBoard G4X is the machine of choice.